Audi's luxury flagship, the Audi A8, impresses with a lightweight aluminum body, powerful and highly efficient engines, the user-friendly MMI operating system and a luxurious interior. 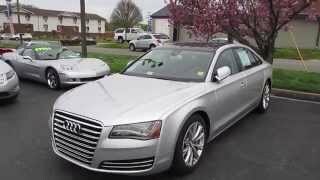 The 2012 Audi A8 L, L for long-wheelbase, features a powerful 4.2 liter FSI® V8 engine that provides 372 hp and 388 lb-ft of torque at 6,800 rpm and 3,500 rpm respectively, up from from the previous model. The A8 and the long-wheelbase A8 L are at the front of the luxury category. The Audi flagship impresses with a lightweight aluminum body, powerful and highly efficient engines, the user-friendly MMI operating system and a luxurious interior. The sporty, elegant and distinctive body of the large sedan is an aluminum Audi Space Frame (ASF), with only the B-pillars made of ultra high-strength steel. Roughly 40 percent lighter than a comparable steel body while also impressing with high rigidity and excellent vibration comfort, it is an exemplary demonstration of Audi ultra-lightweight construction. It earned Audi the Euro Car Body Award, the highest accolade for innovative car body design. The optional LED headlights are another high-end solution. The Audi A8 and A8 L are available with five direct-injection V6 and V8 engines: two gasoline units and three TDI units. The 3.0 TDI with 150 kW (204 hp) is the new entry-level engine. It drives the front wheels and consumes just 6.0 liters per 100 km (39.20 US mpg) in the EU driving cycle. The 4.2 TDI with 258 kW (350 hp) produces the most torque – 800 Nm (590.05 lb-ft). The standard eight-speed tiptronic features closely-spaced gears while still featuring a wide spread for reduced fuel consumption. Its control system is purely electronic, operated with an elegant selector lever and paddles on the steering wheel. The quattro permanent all-wheel drive, standard in almost all models, has a distinctly sporty and rear-biased character. On request, the sport differential dynamically distributes the forces between the rear wheels; this feature is standard with the 4.2 TDI. The A8 and the A8 L offer both luxurious ride comfort and sporty handling. Their wheel control arms are made of aluminum. The brake discs measure up to 400 millimeters (15.75 in) in diameter, depending on the engine. The standard adaptive air suspension with variable damping is integrated into the Audi drive select dynamics system. It can be complemented with the optional dynamic steering. The interior of the A8 enchants with light and elegant lines, craftsman-like fit and finish, and extraordinary attention to the smallest of details. Audi offers the rear seat passengers the option of two power-adjustable and heated individual rear seats, which can be paired with the optional continuous center console. The individual seats can also be equipped with optional ventilation and massage functions, and features such as a folding table and a cool box make the passengers’ stay even more enjoyable. The A8 L is 13 centimeters (5.12 in) longer than the standard version in both wheelbase and overall length. It is available with an optional relaxation seat with power footrest. The relaxation seat includes numerous seating options, such as a massage function and Rear Seat Entertainment. The Audi A8 and the A8 L feature a high degree of technical intelligence. This is manifested in the MMI operating system or the optional MMI touch with touchpad, in the networking of the MMI navigation plus with other vehicle systems and in the assistance systems. The most important of these is the radar-based adaptive cruise control with stop & go function. It works closely together with the Audi pre sense safety system. Other highlights include the night vision assistant with highlighting of detected pedestrians and the parking system plus with reversing camera. Audi also offers many attractive multimedia modules. The top version is the Advanced Sound System from Bang & Olufsen, which boasts 19 speakers. The luxury sedan offers a WLAN hotspot, and Audi has partnered with Google to offer numerous attractive services under the name Audi connect. One highly intelligent solution is Audi online traffic information, which will soon be expanded to include voice-activated Google POI search. BodyThe sporty, elegant and distinctive body of the large sedan is an aluminum Audi Space Frame (ASF), with only the B-pillars made of ultra high-strength steel. Roughly 40 percent lighter than a comparable steel body while also impressing with high rigidity and excellent vibration comfort, it is an exemplary demonstration of Audi ultra-lightweight construction. It earned Audi the Euro Car Body Award, the highest accolade for innovative car body design. The optional LED headlights are another high-end solution. DriveThe Audi A8 and A8 L are available with five direct-injection V6 and V8 engines: two gasoline units and three TDI units. The 3.0 TDI with 150 kW (204 hp) is the new entry-level engine. It drives the front wheels and consumes just 6.0 liters per 100 km (39.20 US mpg) in the EU driving cycle. The 4.2 TDI with 258 kW (350 hp) produces the most torque – 800 Nm (590.05 lb-ft). ChassisThe A8 and the A8 L offer both luxurious ride comfort and sporty handling. Their wheel control arms are made of aluminum. The brake discs measure up to 400 millimeters (15.75 in) in diameter, depending on the engine. The standard adaptive air suspension with variable damping is integrated into the Audi drive select dynamics system. It can be complemented with the optional dynamic steering. InteriorThe interior of the A8 enchants with light and elegant lines, craftsman-like fit and finish, and extraordinary attention to the smallest of details. Audi offers the rear seat passengers the option of two power-adjustable and heated individual rear seats, which can be paired with the optional continuous center console. The individual seats can also be equipped with optional ventilation and massage functions, and features such as a folding table and a cool box make the passengers’ stay even more enjoyable. 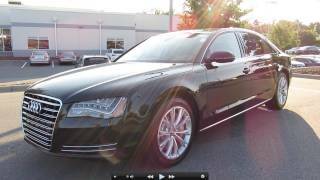 EquipmentThe Audi A8 and the A8 L feature a high degree of technical intelligence. This is manifested in the MMI operating system or the optional MMI touch with touchpad, in the networking of the MMI navigation plus with other vehicle systems and in the assistance systems. The most important of these is the radar-based adaptive cruise control with stop & go function. It works closely together with the Audi pre sense safety system. Other highlights include the night vision assistant with highlighting of detected pedestrians and the parking system plus with reversing camera.